Ladies!! (And some gents) – let's just take this in, shall we? *Inhale... Now exhale and screaaaaam! * LOL! 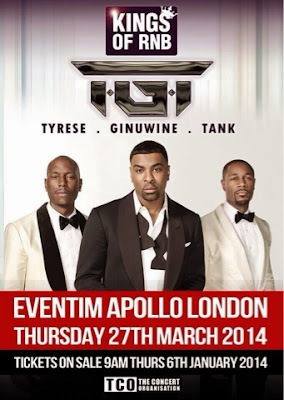 Before 2013 ended TGT – Tyrese, Ginuwine and Tank announced their headlined London show. The group who are all well-respected solo artists as well, will come together for this one-off concert held at London's Eventim Apollo (or known as HMV Hammersmith Apollo). 2013 saw TGT release their debut album ‘Three Kings’ via Atlantic Records, and also a Grammy Award nomination for ‘Best R&B Album’, as well as their own personal endeavors! Their album ‘Three Kings’ went straight to #1 on the US R&B charts, as lovers of the old school and new school R&B went ham in promoting it, and buying it off iTunes and in the stores. Without a doubt, TGT are bound to put on one of the best shows of the year in London – further details about the date, venue, ticket sales etc. Love R&B music, then this show is NOT to be missed! Time: (TBC) on the day of ticket release! Tickets go on sale 9am on Thursday, 6 January, 2014 and can be available to purchase via www.ticketmaster.co.uk / Gigantic or any other online ticket distributor! As I stated before – this event is NOT to be missed! 'Bout to be a shutdown at the Apollo.